The 2018 Protect Wisconsin Waterways Sweep in Whitewater was very successful. 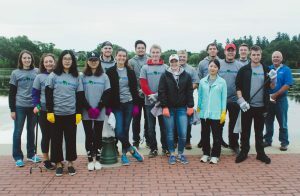 There was a total of 23 volunteers, many of them were University of Wisconsin-Whitewater students, and there were 2 interactions with community members aside from the volunteers. Volunteers started at Cravath Lakefront Park, where they signed in and were given event t-shirts. At this initial location, the Protect Wisconsin Waterways backdrop was set up and Splash made an appearance to take photos with people. 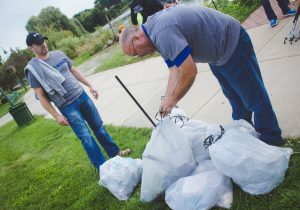 The clean up effort in Whitewater moved to both Trippe Lake Park and the downtown area from the first location. In all, 11 trash bags were filled by the volunteers. They picked up items such as candy wrappers and bottles to a ping pong ball and a small toy boat. Overall, the 2018 Protect Wisconsin Waterways Sweep in Whitewater was highly beneficial for the community.